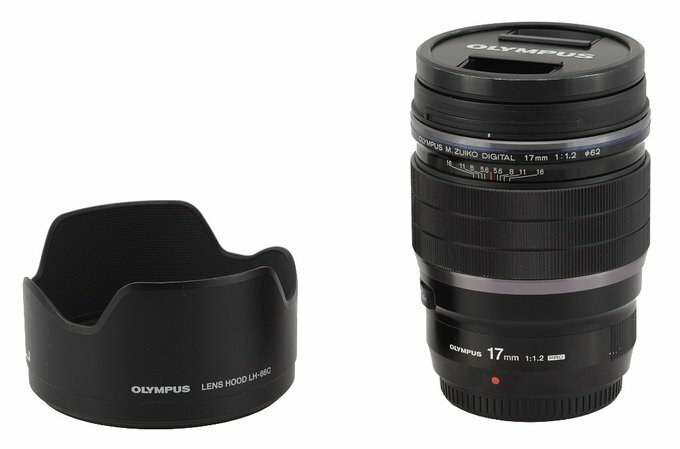 The following chart presents a comparison between parameters of the tested instrument and those of other mirrorless lenses with a similar angle of view. 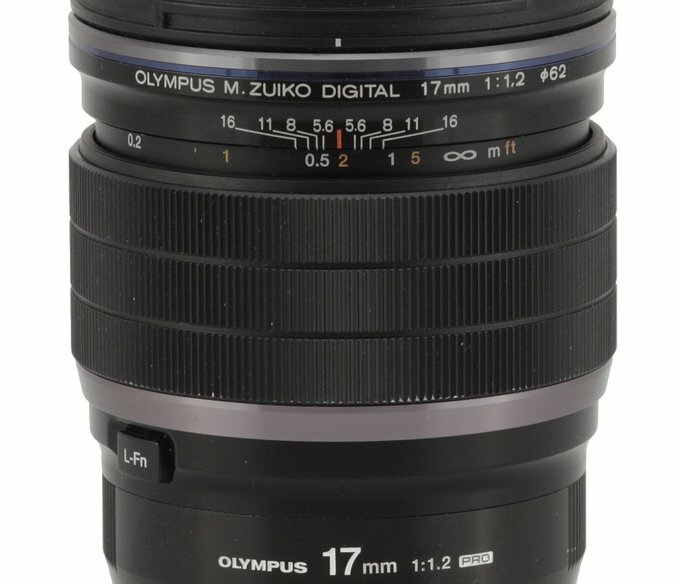 It is clear that the 1.2/17 model is heavier and physically bigger than the Olympus 1.8/17. Of course it is connected to its aperture fastness and a superior build quality of this more expensive, newer instrument. The Olympus 1.2/17 is also more advanced when it comes to the optical construction – even the Voigtlander with a faster aperture features less optical elements. 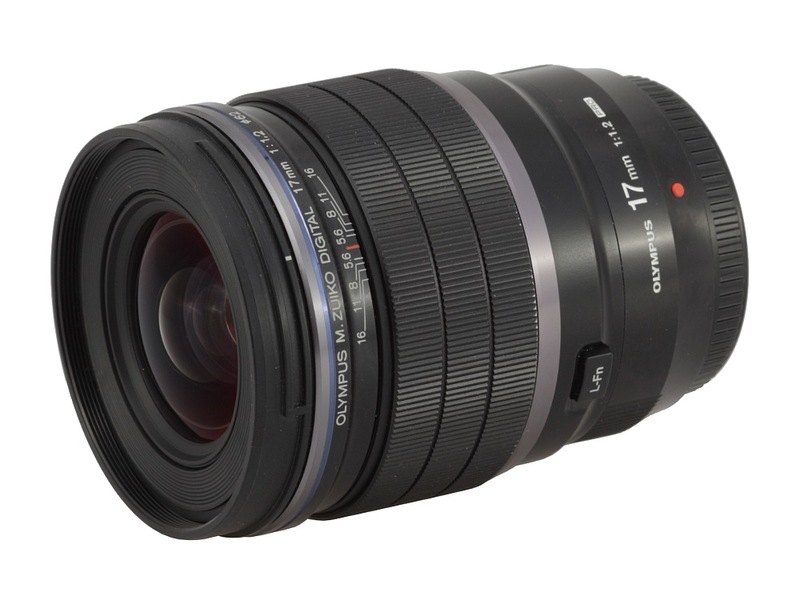 In the photo below the M.Zuiko Digital ED 17 mm f/1.2 PRO is positioned between full frame lenses with similar angles of view, namely the Sigma A 35 mm f/1.4 DG HSM and the Canon EF 35 mm f/2 IS USM. 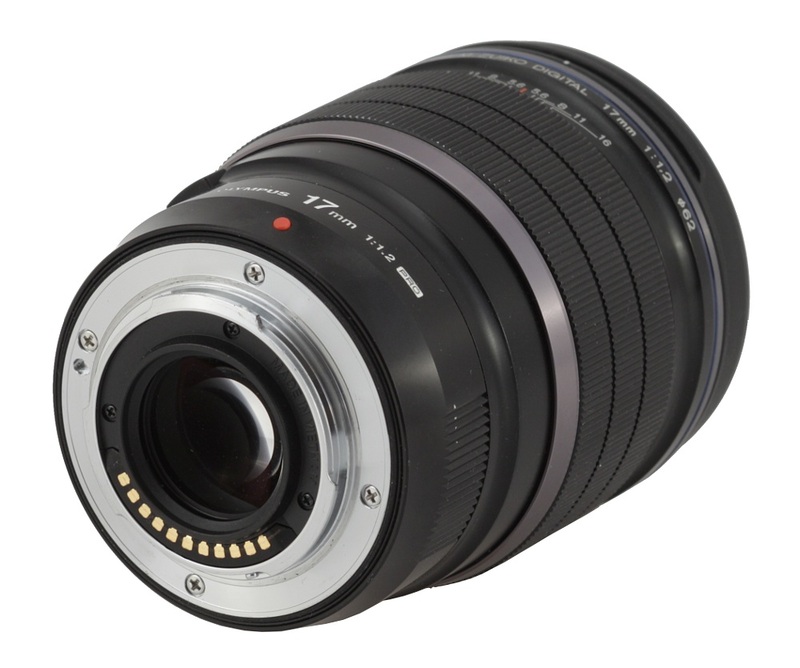 The M.Zuiko 17 mm f/1.2 PRO starts with a metal mount surrounding contacts and a rear element, 22 mm in diameter. That element doesn’t move, is positioned on the same level as the contacts, and its edges and area around them are very well blackened. On the black part with the contact plate you can find information that the lens was produced in Vietnam. It is an interesting tidbit - after all the 45 mm f/1.2 model was supposed to be produced in Japan. The proper body of the lens, completely made of metal, starts with an immobile ring with a red dot, making an alignment with a camera easier, and the name and parameters of the lens are right below. On the other side than the dot you get also information about waterproof qualities (‘SPLASH PROOF’) and the focusing range (0.20m/0.66ft–∞), along with a serial number. Further on there is a black, metal ring which doesn’t move with the L-Fn function button. Then you see a manual focus ring, 32 mm wide. Depending on its position, it works in different modes. When the ring is close to the front element it is a focus-by-wire construction. If you snap it back, closer to the bayonet, it will reveal a distance scale and become mechanical. Its performance is beyond reproach as the movements are smooth and the ring is properly damped. Running through the whole distance scale in the mechanical mode needs a turn through an angle of about 100 degrees. Then you find an immobile part of the barrel with a depth of field scale and markings by f/5.6, f/8.0, f/11 and f/16, along with the name and parameters of the lens and two narrow rings, a blue and gray one. The front element is slightly convex, 38 mm in diameter, and it doesn’t move. It is surrounded by a non-rotating filter thread, 62 mm in diameter, and a hood mount. When it comes to optical construction you deal here with 15 elements positioned in 11 groups. 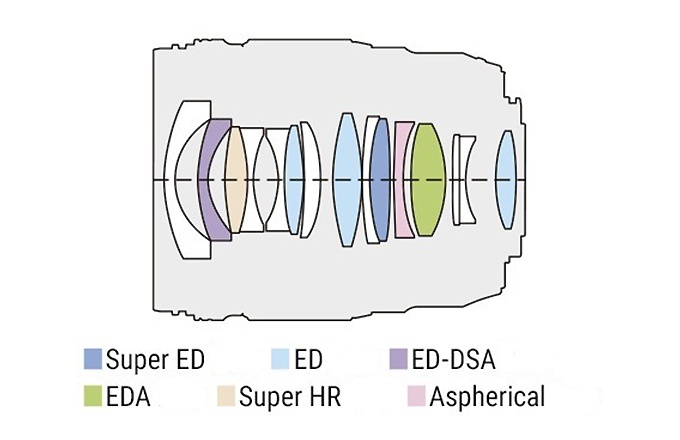 The number of special elements among them is truly impressive: one Super ED element, three classic low dispersion ED glass elements, an aspherical one, and one made of glass with high refraction index (Super HR). Additionally there are three aspherical elements made of low dispersion glass with a single (EDA) and dual (ED-DSA) aspherical surface. 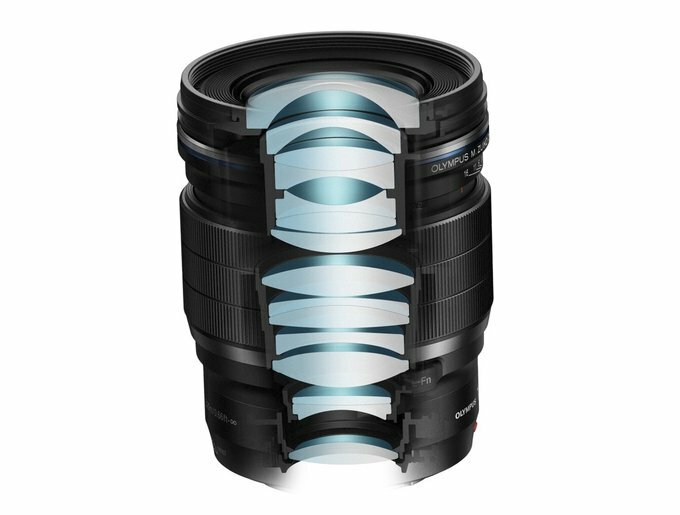 Inside you can also find a round aperture with nine blades which can be closed down to a value of f/16 at the maximum. Buyers get just caps and a hood in the box. It’s a pity in this class of equipment the producer didn’t think of adding any case or pouch to that bundle. Strona wygenerowana w 0.108 sek.